The Salish Sea includes Puget Sound, the Strait of Georgia, and the Strait of Juan de Fuca of Washington and British Columbia. The Salish Sea supports all seven species of Pacific salmon, chinook, chum, coho, cutthroat, pink, sockeye and steelhead. Population declines have prompted initiation of the Salish Sea Marine Survival Project. This project reports that: chinook, coho, and steelhead have experienced tenfold declines in survival during the marine phase of their lifecycle, with total abundance remaining well below levels of 30 years ago. 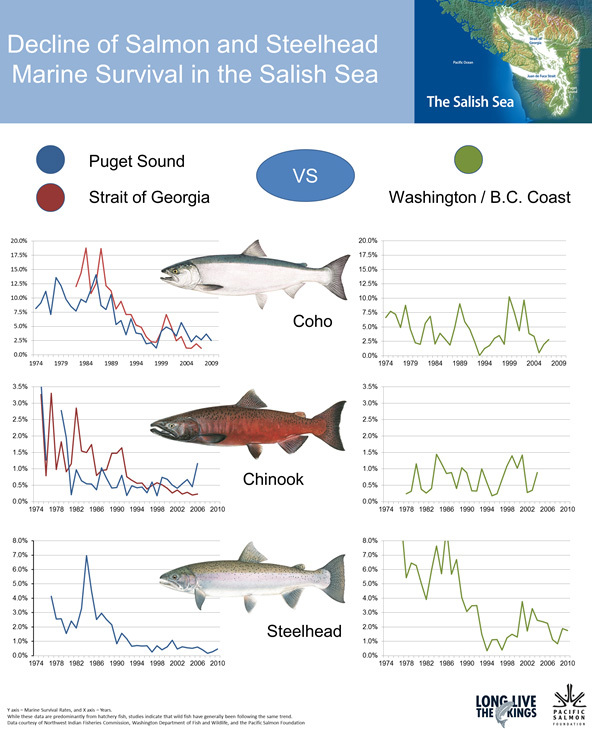 The conditions in the Salish Sea have changed and salmon survival has been declining, Zimmerman et al (2015) observed the primary pattern within the Salish Sea is declining smolt survival from 1977-2010. Of course the salmon begin and end their life cycle in the streams, many glacier fed, and these too have experienced changes that are not favorable for salmon. The Salish Sea is fed by numerous glacier fed streams, all of which have experienced substantial retreat in the last 30 years, with many already experiencing significant summer declines in overall and glacier runoff (Stahl and Moore, 2006; Pelto, 2008). 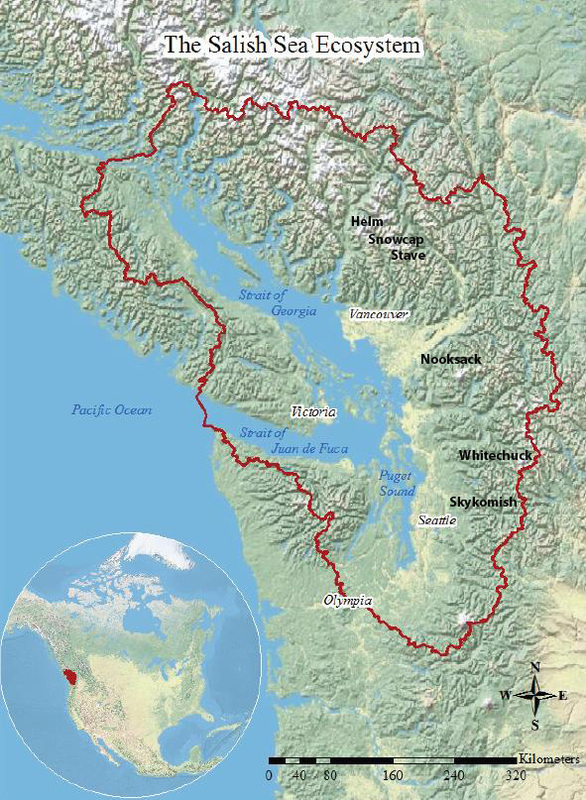 The largest input river is the Fraser River (FR), Padilla et al (2014) note an increasing variability in summer flow, and with a warming climate greater variability in annual streamflow, and hence in hydrological extremes is anticipated, which is not favorable to salmon. 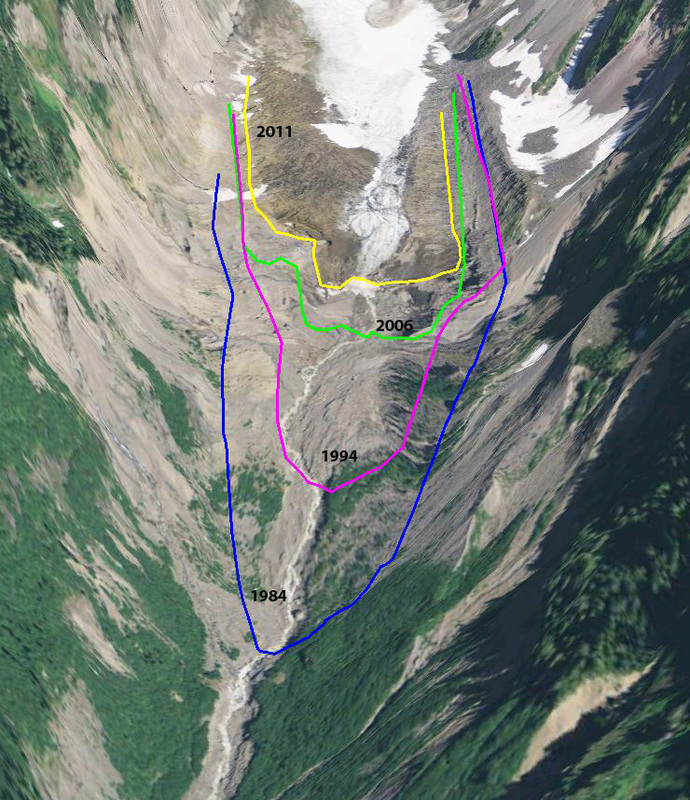 This post provides selected specific examples of observed changes on glaciers in the Salish Sea watershed. The Whitechuck Glacier supplies flow to the headwaters of the Whitechuck River. Its white expanse has graced these headwaters for thousands of years. The Whitechuck Glacier retreated slowly from its advanced Little Ice Age position until 1930, while rapidly thinning. Thus, prepared it began a rapid retreat in 1930. This rapid retreat culminated in the total disappearance of the north branch of the glacier in 2001, our third visit to the glacier. No more does this glacier dominate the headwaters, and its demise has and will continue to alter the hydrology of the Whitechuck River headwaters.The amount of runoff entering the Whitechuck River has declined substantially in the summer. For thousands of years each square meter of glacier has contributed 3 cubic meters of runoff from July I-October 1. With the loss of glacier ice, this contribution should drop by 65-80% based on observations at two other sites where glaciers have disappeared (Pelto, 1993 & 2008). The change since 1950 in glacier area has reduced summer glacier runoff by 5.7 million cubic meters annually. This represents a loss of between 0.55 to 0.65 cubic meters/second for the Whitechuck River during the July-September period. The water will also be less sediment laden and warmer. The impact will be less water for the fall salmon runs, and less food in amount and processing for stream invertebrates on which salmon feed downstream in the Sauk and Skagit Rivers. Milk Lake Glacier also fed this watershed before disappearing in the 1990’s. 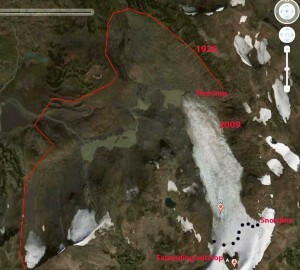 Milk Lake Glacier on USGS map from 1979 and in 2009. Nooksack River: For 31 years we have completed measurements of ablation, glacier area change and runoff in this basin, all are losing mass and retreating (Pelto and Brown, 2012). During stressful warm weather events in the last five years we have measured ablation on and runoff from glaciers in the basin. In addition the USGS gages record discharge and stream temperature in the South Fork, Middle Fork and North Fork Nooksack. During these events runoff measurements below Sholes Glacier and ablation measurements on Sholes Glacier indicate daily ablation ranging from 0.05-0.06 meters per day, which for the North Fork currently yields 9.5-11 cubic meters/second. This is 40-50% of the August mean discharge of 24 cubic meters/second, despite glaciers only covering 6% of the watershed. In the unglaciated South Fork all 12 warm weather events generated a rise in stream temperature of at least 2 C, only 2 event in the North Fork generated this rise. Discharge rose at leasts 15% in 10 of the 12 events in the North Fork and none of the events in the South Fork. As the glaciers continue to retreat the North Fork will trend first toward the more limited impact of the Middle Fork and then the highly sensitive South Fork where warm weather leads to declining streamflow and warming temperatures. Our ongoing measurements of daily runoff and daily streamflow below Sholes Glacier allow determination of the contribution of glaciers to the North Fork Nooksack, which peaked in 2014 at 80% of total streamflow. Glacier runoff surpassed 40% of the total streamflow on 26 days after Aug. 1 in 2014. The Nooksack Salmon Enhancement Association has completed numerous salmon restoration efforts, but climate is one challenge that cannot be restored locally. Response of watersheds to warm weather events. Skykomish RiverThe reduction of the glacial melt component augmenting summer low flows is already resulting in more low-flow days in the North Cascade region. In the Skykomish River watershed from 1958-2009 glacier area declined from 3.8 km2 to 2.1 km2, a 45% decline (Pelto, 2011). A key threshold of in-stream flow levels considered insufficient to maintain short term survival of fish stocks is below 10% of the mean annual flow (Tennant, 1976). For the Skykomish River 10% of mean annual flow is 14 cubic meter/second. In the Skykomish River from 1950-2013 there have been 230 melt season days with discharge below 14 cubic meter/second. Of these 228, or 99% of the low flow days, have occurred since 1985. The loss of 30-40% of the glacier runoff is a key reason for the onset of more critical low flow days. Of more concern for aquatic life is the occurrence of extended periods of low flow (Tennant, 1976). From 1929-2009 in the Skykomish River basin there have been eight years where streamflow dropped below 14 cubic meter/second. for 10 consecutive days during the melt season, 1986, 1987, 1992, 1998, 2003, 2005, 2006 and 2007. It is likely that 2015 will join this list. Fraser River-Southern BC: Koch et al,(2009) observed a widespread retreat and glacier area loss in Garibaldi Provincial Park just to the west, with 20% area loss from 1988-2005. Bolch et al (2010) noted that from 1985-2005 that glaciers in the southern Coast of British Columbia lost 10% of their area, 0.6% per year and that the rate was increasing. By 2015 this area loss is certainly greater than 15%. For a longer time span Tennant et al (2012) noted that from 1919-2006 the glaciers in the central and southern Canadian Rocky Mountains lost 40% of their area. Of the 523 glaciers they observed 17 disappeared and 124 separated. Many of these do not drain into the Salish Sea, but does give a sense that the overall change is larger than 20%. 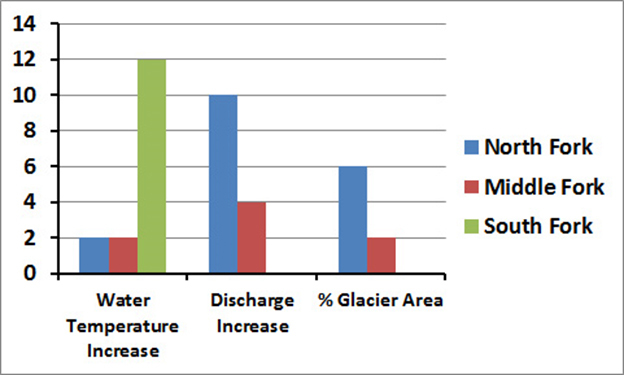 The change in glacier area is key because observed melt rates increases have been less than 20%. Hence, as glacier area declines at a greater rate than glacier melt rate, glacier runoff declines. The Helm Glacier below exemplifies the change from a shrinking area of ice available for summer melt, since 1928 the glacier has lost 78% of its area. Helm Glacier drains into the Cheakamus River, which supplies Daisy lake Reservoir and the BCHydro 157 MW Cheakamus Power Plant. The Cheakamus River has the Dave Marshall Salmon Reserve with over 14 kilometres of winding, re-enhanced salmon spawning river channels off the Cheakamus. 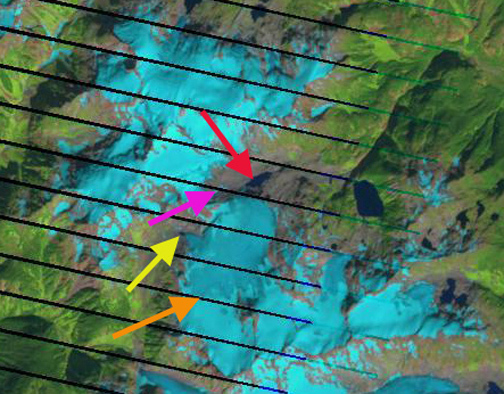 Red and Yellow Arrow indicate new lakes formed in the last six years by retreat of Snowcap Creek Glacier. 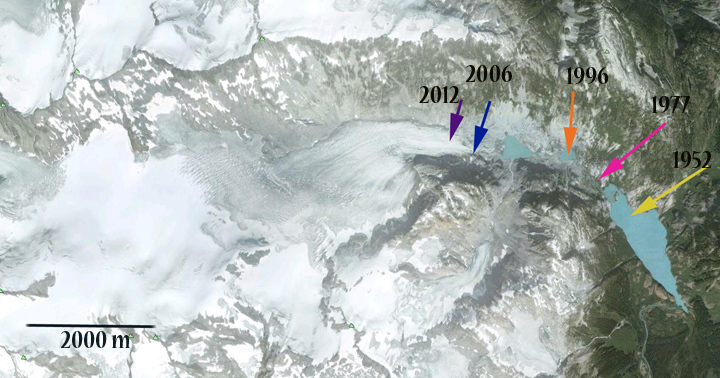 Snowcap Creek Glacier has retreated 900 m since 1992 with a new lake forming at its terminus. This glacier drains into Harrison Lake. Harrison Lake is considered a location where salmon populations have remained stronger and features five species of salmon – sockeye, chinook, pink, coho, and chum that pass through the lake in the summer enroute to spawning grounds. Snowcap Creek Glacier shares a divide with Stave Glacier at the headwaters of Stave Lake which is the part of the 205 MW Stave Lake-Hayward Reservoir-Ruskin Dam Hydropower facility. The dams do not have fish passages cutting off salmon from most of the watershed. There are kokanee salmon a landlocked version of the sockeye salmon.This glacier has retreated at a rate of 100 meters per year from 1996 to 2012. This is the fastest rate of retreat since 1900. 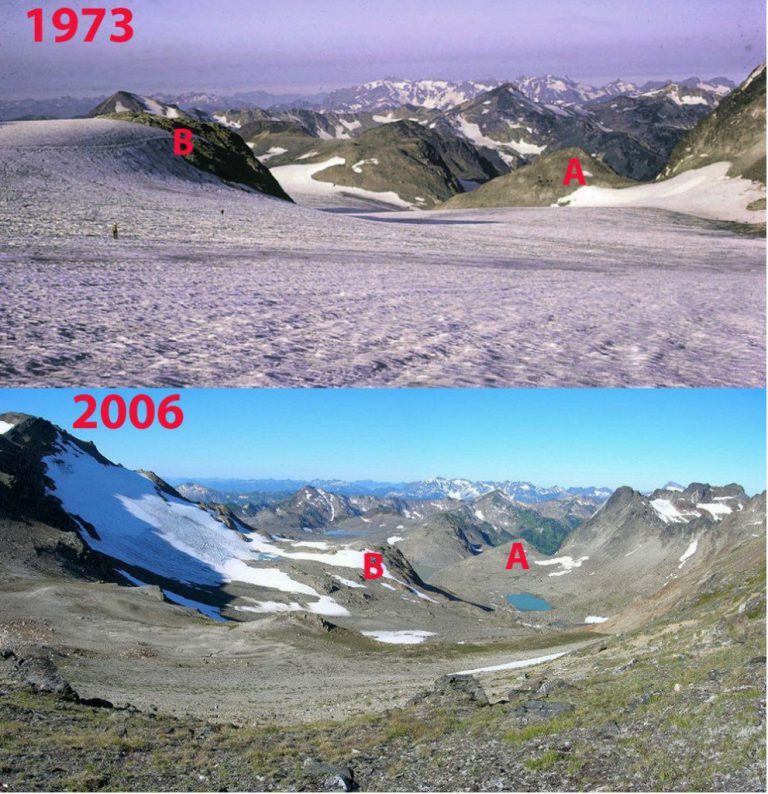 Stave Glacier Retreat Koch et al (2009) documented retreat from 1952-1996. Overall salmon are being faced with increasing climate stress in rivers on top of long term habitat alteration at the beginning and end of their life cycle, then mature in the changing and challenging conditions of the Salish Sea. Our Nooksack Indian Tribe partners Oliver Grah and Jezra Beaulieu discuss glacier runoff measurement, runoff changes and salmon in an interview completed during work at the runoff gage below Heliotrope Glacier on Mount Baker.